The GA90 VSD – sizes from 18kW to 315kW. 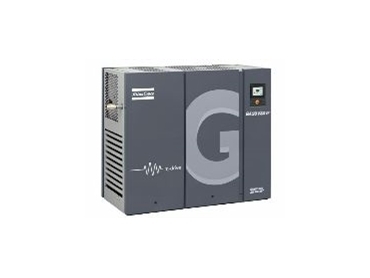 ATLAS Copco's GA90 VSD (Variable Speed Drive) air compressor is currently in its fourth generation, combining frequency converter technology with an induction motor to reduce energy consumption. According to the company, the VSD technology is not simply an 'add-on' frequency inverter to a standard compressor package. Engineers are said to have worked closely with the engineers of the drive and motor manufacturer during the development phase to integrate the drive system into the compressor package. Considerations were given to EMC compliance, avoidance of resonance frequencies throughout the speed range, and the optimisation of drive parameter settings. With the electricity consumed by industrial air compressors accounting for 10-20% of a manufacturing facility's total electricity bill, VSD air compressors are said to provide valuable energy saving for Australian manufacturers. The oil injected screw compressor is available in sizes of 18 to 315kW.